Give us your soup, your chili, your deli treats! World Art™ Soup Containers can handle it. The compostable Ingeo™ lining prevents leaks and nifty color coded sizes help you grab the right container when the lunch line is getting long. When you have had your last bite, these containers can be composted in one easy step. No matter what you put in it, World Art™ Soup Containers are a better alternative to foam. 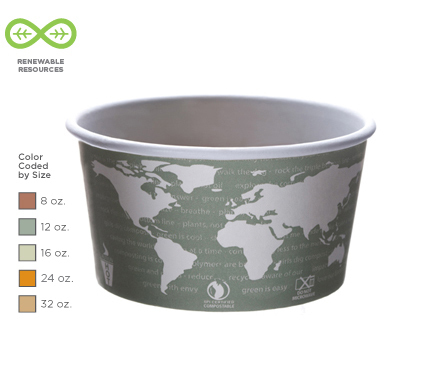 Traditional soup cups are lined with petroleum, the world's most valuable, non-renewable resource, making them not compostable or recylable. World Art Renewable & Compostable Paper Food Container - 4oz. Soup Cups lined with PLA are a wonderful alternative to traditional containers made from oil. Welcome our newest addition to the World Art™ soup container line up. Fully compostable. 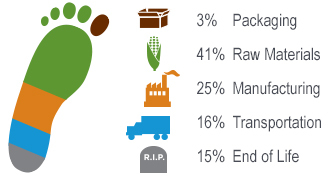 We think a disposable soup bowl should only be made from renewable resources, not foam. When you need a small, round cup or container for a variety of foods. Large compostable soup containers hold deli items without leaking. Our small EcoLid® renewable soup cup lids are the perfect cap for your perfect cup of soup. Try our large EcoLid® compostable soup cup lids for our larger soup cups.